May you all have a safe and happy time celebrating the beginning of 2008, and a prosperous New Year. I didn't do a year in review blog this year--I've been too busy reading, watching movies, and playing Sudoku to write...and that's okay, because the theme for 2008 is not looking back, but rather, looking ahead and enjoying every minute of the present. That's what I called tonight's concert. It went very well, and I was home by 9:00. I'm glad it's finished. I just have one eensy little field trip tomorrow morning and then I am D-O-N-E. For two glorious weeks. Mom and Dad came to the show, and took Millie back with them so I won't have to tomorrow. I miss her already! She's my little cuddlebug. And with that, I'm off to have a bath and a snack...then it's too bed! That's me this week. I am soooo on my Winter Break already! I remain remarkably unstressed about the concert I am putting on this Thursday. My colleague Larry tells me I'll get over this, but so far, I'm relaxed, confident, and ready to do it. So here I am, two days down and three to go before I'm out for two weeks. They will prove to be busy, as I have programs to copy, the concert, a cash box to set up, and one more field trip to do (on Friday). Mom and Dad are coming down for the concert. They will take Millie back with them, so that on Friday, I can leave straight from school and come home. I've already started setting things aside to pack, to make things easier come Thursday and Friday. Right, I think I'll have a nice warm bath and listen to my Holidays playlist on iTunes. Lovely! Today I have baked 80 miniature cookies (okay, okay, they're the pre-cut dough kind by Duncan Hines) and I've made a huge pot of potato leek soup. I have a quiche in the oven (breakfast for the week) and two dozen gingerbread cookies (again, the pre-made dough) waiting their turn. Why the baking craze? Well, it's Goodies Week. All the teachers in my house will take turns bringing in goodies on Tuesday, Wednesday and Thursday. Tuesday is my day (we're going alphabetically by last name). In addition to all the cookies, I want to make a loaf of cranberry-orange bread, and I bought Hershey's Candy Cane Kisses. Channelling my inner Martha, I made cute little DV Teacher Survival Kit tags for my colleagues and attached them to M&Ms packets. The tags instruct the recipient to eat one brown for having tons of grading, one orange for confiscating cell phones, etc. At the bottom it says, "If symptoms persist, eat the whole bag." I'm loving my weekend! Yesterday I got my hair done in a sassy new hue--blonde highlights and copper lowlights. It's very bright and different, but I like it. After the hair appointment, I came home and cleaned my apartment from top to bottom. Today I have been getting some stuff done for school, relaxing, and, of course, baking. This week promises to be busy. I have a follow-up appointment with the psychologist I met last month, a holiday concert to put on, packing to do for my Christmas trip to Mom and Dad's, one more elementary school to visit, and other assorted things. My Christmas shopping and wrapping is, fortunately, all done, though I need to mail the gifts I bought Aaron, Susanne, and their kids. Now, I have to give a quick shout-out to Heather and Arturo: Many congratulations on your engagement!! Arturo, you have picked a winner in Heather. May you have a long, happy life together, and you can be sure that when you eventually have your little Sean Juan or Bailey Cuervo (! 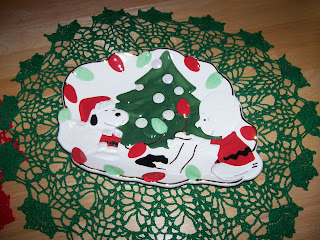 ), Auntie Meg will provide the first Snoopy toy. Well, the quiche should be done soon, and I have cookies to bake, a bread mix to whip up, and a kitchen to wipe down. I'm feeling very domestic and goddess-like already. The field trips continue to go well. The little kids are so cute. They love singing along with my kids, and their faces just light up. The principals love it. My kids love it. I love it. What a great thing! However, it is exhausting, and I can feel a cold coming on...ugh! I've just completed sub plans for today and tomorrow. I will not teach a class for the rest of the week. I'll be out and about with the kids both days. Tomorrow night, we also have two carol gigs out in the community. I was honored to be invited by my bosses to have the kids sing at a party for all of the district administrators. It is a wonderful opportunity for both the kids and myself to show off a little. As soon as I am finished on Friday, I am coming home for a weekend of relaxation and comfort. I am getting my hair done on Saturday (haven't had it cut or colored since August!!) and cleaning this apartment. Sunday is all about sitting around relaxing. I might scrapbook. I do intend to bake a little, and start setting aside stuff to pack for my Christmas trip to Mom and Dad's. Next week the big thing is my winter concert for Divine and Show, but I'm remarkably unstressed about it. Well, I'm going to sign off now. It's time for another dose of Airborne, and then a good cuddle under a large stack of blankets and one very cuddly cat. I'm going to try to go to sleep early tonight. I really can't get a cold right now!! Field Trip days this week, that is. I'm not a huge fan of field trips...but they do make the day fly by. And there were no gigs tonight, leaving your Blog Hostess free to watch her brand-spanking-new DVD of Harry Potter and the Order of the Phoenix. With a warm putty tat on her lap. I had three Christmas cards, two ornaments and two eBay purchases waiting for me when I got home from work today. The Christmas cards were from my Aunt Carolyn, Grandma Cooper, and Roz, a wonderful English lady I worked with at Mervyn's when I was just out of college. 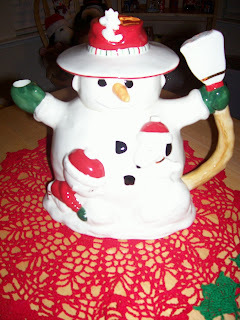 One of the ornaments was from Kathy and Derek, which, of course, brought a smile. As for the anonymous NASCAR friend who sent me an ornament...I said it at our message board and I'll say it here--thank you from the bottom of my heart. I'm enjoying my adorable little home. Here's some pics of my Christmas set-up. Over the summer, Mom made me this tree skirt. Cute! Okay, so, admitedly, sitting in the "driver's seat" of a racing arcade game in the foyer of the local WalMart isn't exactly hard work, but still...you sit there for an hour watching a dozen hyperactive teenagers singing carols. It's not as fun and exciting as it may sound. It's what I did last night, after following the above-mentioned teenagers to a couple of different house parties in town. Imagine my relief when they all got tired of singing at WalMart and I got to go home. Lovely! This year I've been so much less stressed about carol gigs. Part of it, of course, is the meds, but also, there is something to be said for having last year under my belt. But having less stress does not mean that I like going on carol gigs--it's a necessary evil that comes with my job (even though I don't actually get paid for it). I still resent, just the tiniest bit, the parents who expect me to be out 'til all hours, all over the east bay, with their kids. I really resented sitting in the school parking lot (not the safest place for a young single woman) at 7:00 last night, waiting for perpetually-late teens to show up. And frankly, I'm surprised I can still listen to The First Noel without upchucking. Remarkably, I'm still able to listen to my holiday songs on iTunes, and I'm absolutely loving my decorations, and the Christmas shopping. It's just carol gigs I dislike. I love this!! I really do! A year ago, I was a bloomin' wreck. I was smack dab in the middle of a certain political/racial battle at school because my then-boss was, well, that's better left unsaid in a public forum. I was facing my first concert at the new job and it was stressful as all get-out. To top it all off, carol gigs were all around, and I, Little Miss Control Freak, felt completely out of control. This year, due to a combination of 1) experience and 2) medication, I'm in such a nice place. Yes, it's hectic, crazy, and a little bit stressful, but I'm handling the carol gigs and our upcoming holiday concert (Dec. 20 at 7:00 pm, if any of my buds are interested in coming...) with a certain aplomb that surprises me. Of course, I've had my moments of wanting to scream, but overall, I'm so...freakin' cheerful. Amazing. After all, Christmastime has always been one of my absolute favorite times of year. It goes beyond presents and Santa and the miles of Snoopy Christmas ornaments I have. It's about the short, cold days, the smell of pine and wood smoke, people giving to charity. There's something so wonderful about decorating my apartment (Snoopy's Christmas Wonderland) and listening to the "Holiday" list on my iTunes. I'm even excited to write my Christmas cards. So here I sit, three feet away from a half-decorated tree, with a tableful of Snoopy and England ornaments on the table behind me, waiting to be lovingly hung. I've already bought and wrapped two presents (gotta love Internet shopping!) --one each for Mom and Dad. Even Millie is getting in the spirit--I tied a red bow to her "sweet spot" lamp so she can share in the joy with me. After all, we're approaching our 8th anniversary next week, and she was, hands down, the best Christmas present I've ever received. I've even installed a timer for my outdoor Christmas lights, so that not an evening will go by this month without me spreading my holiday cheer to the entire apartment complex. Bring on the holiday parties, the endless Christmas songs, and all the cookies I can eat. Give me twinkle lights and hot chocolate with whipped cream. Give me random acts of kindness from strangers and toys for every needy child. It's Christmas, I'm happy again, and life is good. I'm channelling my inner Martha Stewart today. As I had no carol gigs with my darlings, I have had a lovely, but not lazy, day at home. After a brief excursion to the grocery store and Party City, I came back to my apartment to get my Christmas mojo going. First, I had to bake something. You simply cannot get through December without baking, right? I made a loaf of cranberry-orange bread (from a mix, not from scratch--I'm not channelling that much Martha) to take to work tomorrow. Then I unlocked my storage closet and started hauling boxes around. I have three large containers full of Christmas stuff, and an artificial tree. 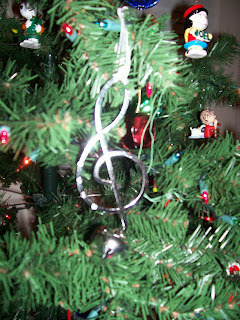 The tree is up, but I haven't done the ornaments yet--those I'll do little by little throughout the week. I've put lights and bows up outside, and all of my stuffed Snoopy and Woodstock dolls are arrayed throughout the living and dining rooms. A little while ago, I made a ham and mushroom quiche, and fresh cranberry sauce--from scratch. My itsy bitsy food processor was put through its paces chopping cranberries, apple and orange...and the result is fabulous. Have I ever mentioned how much I love the holidays?